I have always been a firm believer of this quote and the book community only showed me how this quote is so true, because it is one of the most supportive and best communities ever. 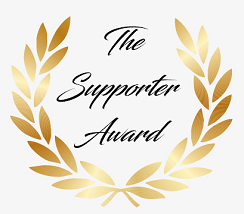 This blog is only 3 months old but I have seen love and support from people and I want to give back by making this award. Also I have seen that are not many new awards and that we keep doing the same awards so here goes nothing. Thank you for the nomination, Hamad! 💕 It was such a nice idea for you to make this award! This is such a wonderful new award, and you are right there aren’t that many new ones out there — this is a great addition! Thanks Kaleena, actually you were one of the reasons that made me create this because I thought it would be fun and cool to add a new award! Awww, Thanks Carolina and you’re welcome! Oh my gosh that is such a compliment, thank you! I think you have made a great addition to the blogging community, and I am glad to have played a part in the inspiration! I love this and you ❤ Thank you Hamad!! Lovely idea for a new award! Ah cool answers and congratulations on this! I kind of liked Mocking jay ending although I was warned that I may hate it.